The Best Bass Guitars Under $500 in 2019: reviewed and rated here! If you’re on a moderate budget and are on the quest to find the best bass guitar under $500, you’ve come to the right place. Whether it’s a starter bass or a backup you’re looking for, you’ll surely find one or two to your liking in this list. We’ve selected the best basses that are priced at about half a thousand bucks but are worth a lot more. The bass guitars on this list are suitable for players of all levels, from complete beginners to pros looking for an instrument they can play around the house. Let’s take a look! Epiphone Viola Electric Bass Guitar The Viola is without a doubt one of the most easily recognizable bass guitars on the planet. It’s also highly affordable if your budget falls below $500. It sports that iconic viola body shape and it’s got that vintage tone to boot. The Epiphone Viola Bass is also equipped with improved electronics, which include NYR and NYT mini humbuckers. Epiphone EB-3 Electric Bass Guitar Another classic bass offering from Epiphone, the EB-3 Bass is touted as “the SG bass that defined rock.” The Epiphone EB-3 faithfully recreates the classic EB “SG” bass in one affordable package. This bass guitar features a mahogany body and neck, a pau ferro fingerboard, an NYT bass mini humbucker at the bridge and a Sidewinder humbucker at the neck. Fender Standard Jazz Electric Bass Guitar When it’s time for bass players to upgrade to a pro-level instrument, the Fender Standard Jazz Bass is always at the top of the most recommended models. The Fender Standard Jazz Bass combines a traditional J-Bass design with modern features and is equipped with a pair of contemporary-style single-coil Jazz Bass pickups that won’t let you down. Ibanez SR400EQM Electric Bass Guitar It’s hard to peel your eyes away from the Ibanez SR400EQM, particularly the Dragon Eye Burst model with its striking quilted maple top. The SR400EQM also features a mahogany body and a five-piece maple/rosewood neck. It’s equipped with a pair of PowerSpan Dual Coil pickups and an Ibanez Custom 3-band EQ with a three-way Power Tap switch. Yamaha TRBX305 Electric Bass Guitar Here comes a powerful 5-string bass under $500! The Yamaha TRBX305 is a highly versatile bass guitar with a tone fits well in any musical style. It features a five-setting Performance EQ active circuitry so you can experiment with a multitude of sounds. It’s comfortable to play as well with its well-balanced mahogany body and sturdy five-piece maple/mahogany neck. Epiphone Thunderbird PRO-IV Electric Bass Guitar The Epiphone Thunderbird Pro-IV electric bass boasts a 7-ply walnut and maple through-neck with body wings made of mahogany. The look is striking and the sound, thundering. The neck-through-body design gives this bass loads of sustain, and the T-PRO Bass pickups at the bridge and neck capture the booming bass sound efficiently, producing an overall well-articulated and pure bass sound. During the mid-Sixties, bands and other pop-rock acts from the UK such as the Beatles and the Rolling Stones became highly popular in the United States, bringing with them other aspects of British culture to the rest of the world. This cultural phenomenon came to be known as the British Invasion. The Viola bass is one instrument that springs from this period in music history, and it’s back with its mode looks and vintage tone. What it doesn’t have is the vintage price tag, so you won’t have to worry about coughing up thousands of dollars to own one. Thanks to Epiphone, we now have a classic-sounding Viola bass that’s equipped with modern electronics and is as fun to play. The Epiphone Viola Bass has a semi-hollow laminated maple body with a striking Vintage Sunburst finish. This bass has a beginner-friendly 30.5-inch scale neck. The neck is also maple and it’s topped with a 22-fret pau ferro fingerboard with dot inlays. For the electronics you have an NYR mini humbucker at the neck and an NYT mini humbucker at the bridge. Each pickup has its own volume control knob and you also get a master tone control knob. 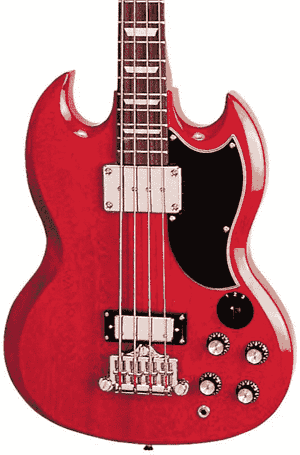 The Epiphone EB-3 is an SG-shaped bass guitar. The SG bass made waves when it came out in the early Sixties, becoming the go-to instrument of many famous musicians such as John Entwistle of The Who. The EB-3 is a modern version of the classic SG, improving on the classic design with new electronics but retaining the same vintage feel. The Epiphone EB-3 boasts a mahogany body and mahogany neck, both done in the much-loved SG shape. The neck is topped with a pau ferro fingerboard with 22 frets and trapezoid inlays. This bass has a full-scale 34-inch neck, but beginners shouldn’t be overwhelmed as it’s easy and comfortable to play. 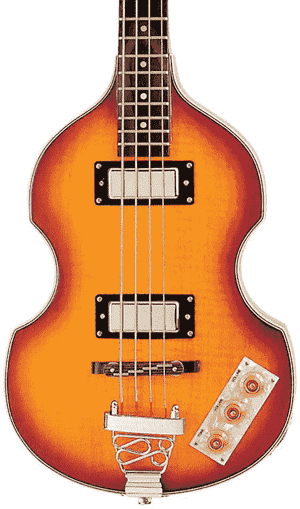 The EB-3 bass by Epiphone also features a unique dual pickup set. At the neck position you’ll find a Sidewinder humbucker and at the bridge there’s an NYT mini humbucker. The Sidewinder effectively delivers a full and thick tone that’s rich with lows and mids, while the NYT mini pickup tops it off with just the right high-end details for an overall well-balanced tone. Tone-shaping is done via dual volume and tone controls, and you also get a three-setting transformer switch so you can adjust the frequency response. 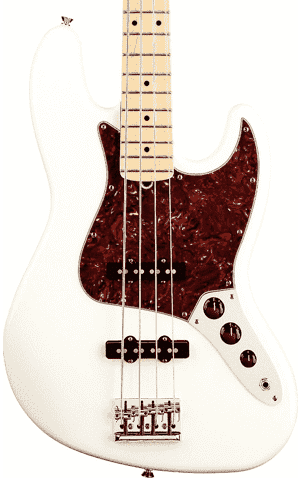 Fender’s reputation for quality extends even to its lower-priced models such as the Fender Standard Jazz Bass. This electric bass guitar combines the traditional J-Bass design with plenty of modern upgrades, making it a great option for bassists of all levels. The Fender Standard Jazz Bass has a contoured alder body and a maple neck with a modern C-shaped profile. The neck is designed for performance and comfort and the back is given a smooth tinted satin urethane finish. It has a maple fingerboard with 20 medium jumbo frets but you can also opt for one with a pau ferro fingerboard, though that option is a bit more expensive. This bass guitar boasts a pair of Fender Standard single-coil Jazz Bass pickups. The shielded body cavities of the Standard Jazz Bass contribute to a reduced hum. You get two volume controls, one for each pickup, and a master tone control knob for shaping your tone. Of course this bass already has that iconic Jazz Bass tone with lots of warmth and bottom-end punch. Other specs include chrome-plated hardware, a 4-saddle Pure Vintage ‘70s bridge with single groove saddles and Standard open-gear tuners. An excellent bass for the price! Trusted by bass players the world over since the late Eighties, the Soundgear or SR series of basses by Ibanez ranks high among the best bass guitars in the world because of their overall performance and affordability. There’s an SR bass for every budget, and if you’re looking for the best bass under $500 we recommend the Ibanez SR400EQM, which has everything you’ll ever need in a workhorse bass. 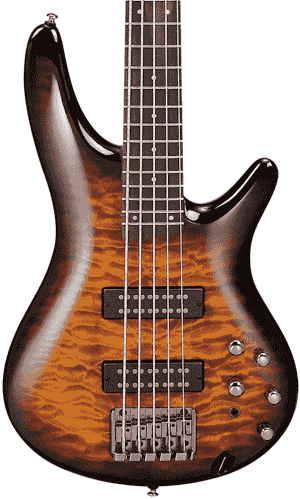 The Ibanez SR400EQM has a mahogany body with a quilted maple top, which adds to the bass guitar’s classic beauty. The combination of maple and mahogany results in a rich and warm sound with clarity and sustain. The neck is of a five-piece maple and rosewood construction that provides stability along with a warm tone. Topping it is a rosewood fretboard that offers a smooth playing feel. 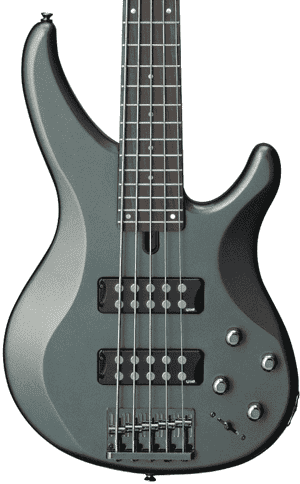 This bass guitar boasts two PowerSpan Dual Coil pickups at the neck and bridge positions. The pickups produce a stronger signal thanks to their exposed pole pieces. The output from the passive pickups can be controlled via the Ibanez Custom Electronics 3-band EQ, which features three-way Power Tap switch so you can swap between Tap, Series and Power Tap modes easily. The Yamaha TRBX305 comes from an impressive line of basses geared toward pro players. Yamaha’s TRBX series boasts the flexibility, comfort, playability, durability and performance that serious bassists need from their instrument. The Yamaha TRBX305 is specially designed to make sure that bass players have everything they could possibly need to create and define their own voice. This five-string bass features a beveled mahogany body that’s perfectly balanced for optimum comfort and a five-piece maple and walnut neck for maximum stability. The mahogany body gives the bass a warm tone with lots of emphasis on the lows and the mids while the neck adds just the right brightness. The TRBX305 also has a smooth-playing rosewood fingerboard with 24 frets. This five-string bass comes with a pair of Yamaha M3 humbuckers. At the neck position you have the MHB3n and at the bridge position there’s the MHB3b pickup. This pairing results in a clear output with none of the hum and muddy lows that plague other models in the same price range. For tone shaping, you get a five-setting Performance EQ switch (for solo, flat, finger, slap and pick modes) as well as master volume, bass, treble and pickup balancer controls. Revered by many bass players around the world, the Thunderbird bass has proven to be a top performer both on stage and in the studio. It’s undoubtedly iconic with its distinctive shape, striped look and thunderbird logo – it just looks all kinds of cool. This bass isn’t only visually appealing but sonically pleasing too. The Thunderbird Pro-IV is Epiphone’s T-Bird offering for bassists on a moderate budget. This bass features a seven-piece walnut and maple through-neck complemented by body wings of dark mahogany. The wings give the bass a wealth of lows and mids, while the walnut/maple neck provides the right balance by yielding a brighter sound. Because of the through-neck construction, the Thunderbird Pro-IV delivers an exquisite blend of sound from the three tonewoods. The neck has a comfortable slim taper profile and is topped with a smooth 20-fret pau ferro fingerboard, ensuring that the bass not only sounds great to your ears but also feels awesome in your hands. The Epiphone Thunderbird Pro-IV is equipped with a pair of T-PRO bass humbucking pickups at the neck and bridge for a well-articulated sound. Tone shaping is done via master volume, blend, high EQ and low EQ control knobs. These bass guitars under $500 are all exceptional models for the price, and we won’t blame you if you have a difficult time choosing which one to get. Any one of these is sure to thrill players and impress audiences, so how do you make your selection? Follow these buying tips! Bass guitars vary a lot in terms of the tonewoods used, the pickups, active circuitry and even in the strings they use. If you have a particular feature in mind you’d like your bass to have, you can narrow down your options based on this. For instance, if you’re particularly fond of a semi-hollow body or a short-scale neck, the Epiphone Viola Bass is the clear winner among the other models listed here. On the other hand, if you prefer Jazz Bass pickups, then choosing the Fender Standard Jazz Bass is a no-brainer. Looking for a 5-string? Then it’s the Yamaha TRBX305 for you. If a particular bass guitar model doesn’t quite meet all of your preferences, don’t cross it off your list right away. Consider how it can be upgraded or set up to have the specs you want. Even the best bass guitars under $500 offer plenty of room for improvement, so with some tweaking and replacement parts here and there you can turn your instrument of choice into your dream bass guitar. Different bass guitars produce different tones because of their construction, materials and electronics, so if you want to see which one delivers the tone that you want, you have to listen. Check out demo videos and bass guitar reviews so you can get an idea of how they sound. The overall output can be influenced by the amps used as well as the audio and EQ settings however, so make sure to factor those in. Nothing beats being able to play a bass in person to see how it sounds and feels in your hand of course, but if the music stores you have access to don’t have the model you’re interested in, demo videos and bass reviews are the next best thing. If a bass sounds like a chorus of angels to you, that’s a good sign you’re making the right choice. Sometimes all it takes is just a glance to know if a bass guitar is ‘The One.’ What you find aesthetically pleasing in a bass can be influenced by your own personal style and your musical inspirations. Do you lean toward a vintage, classic look? Are you inspired by musicians from the Sixties? If so, then the Epiphone Viola Bass, Epiphone EB-3 or the Fender Standard Jazz Bass may be right up your alley. Perhaps the Dragon Eye Burst finish on the Ibanez SR400EQM makes your spine tingle. Or perhaps the shape of the Epiphone Thunderbird Pro-IV calls to you like a lover – in which case, you better make sure it ends up in your arms! An added benefit of choosing a bass guitar that makes your head turn is that it can motivate you to keep on playing even if you’re not particularly up for it. If you’re experiencing some doldrums in your career or bass lessons, having an instrument you can’t take your eyes and hands off can spur you into action. You will practice more or simply just noodle with your bass – and come up with a catchy new riff. Holding something you consider precious will inspire you, get you in the mood to play and make you look forward to becoming the best musician you can be. So by all means choose the bass guitar that makes your heart go thump!